At Robert Hanson’s Portland studio on NW Quimby, the artist and his friend and colleague, Anne Johnson, discuss the evolution of his current work. Robert Hanson’s elegant drawings show us a world filled with irony and whimsy, humor and sadness, insightfulness and, yes, beauty—and all in plurality. 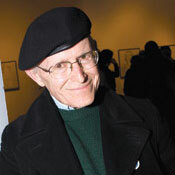 PNCA is honored to have a 30-year affiliation with Faculty Emeritus Robert Hanson. His work as a teacher and artist continues to enrich the school, its students, alumni and the creative community to which they belong. A decade after retirement he continues to bring us to gates that will swing open for us if only we are willing to step through them and pay close attention to what we see. The work featured here is from an exhibition held in PNCA’s Feldman Gallery. For the exhibition catalog, the artist and his friend and colleague PNCA faculty member Anne Johnson, discussed the evolution of his current work at Robert’s Portland studio on NW Quimby. Anne Johnson In the early 70s, not long after you arrived in Portland, I spotted your work in one of the exhibitions of Oregon art held every year at the Portland Art Museum. You showed two big paintings, process-oriented, late-modernist abstractions. Remember them? I liked them a lot. They were rigorous, and also quite beautiful, very tactile, subtle in color. You stayed with abstract painting another 20 years, but I think you always worked on figure drawing on the side. Is that right? Robert Hanson Yes, but I haven’t thought of drawing as being “on the side.” It’s just what I do. I’ve been drawing—the head, actually—from the early 70s on, but it wasn’t until the 90s that I really made a concentrated push to focus on drawing. Given my subject matter, I found the brush not as expressive or satisfying a tool, so I stopped painting altogether. 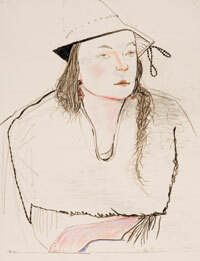 I didn’t show the new drawings, a series of self-portraits, or variations of myself, until 1995, at Elizabeth Leach. That’s also the first show I did juxtaposing text with images. 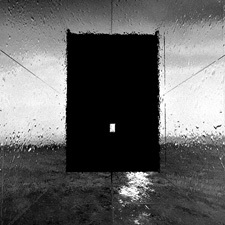 AJ That was Versions of the Self, a really surprising show—your response to Derrida’s Memoirs for the Blind, I recall. In one section of the book, Derrida used a series of Fantin-Latour self-portraits to support his argument that self-portraits are impossible. I remember you pointing out the lighting. Most of those heads were Cyclops-like, with one eye hidden in shadow, the other well-lit and wide-open, staring, straining to see. RH That’s right, Memoirs of the Blind was my starting point. Actually, I even did the drawings for that show in a rather dark studio, with very little natural light. I really liked the process. Each day I would do several small drawings, 2 × 2 or 2 × 4 inches—they were essentially in the hand. I had a small mirror, and a lamp, and I would just get in front of the mirror and draw, mostly in pencil, in that small format. One of the projects I did for that show was a series of self-portraits in the form of groups of drawings. There were about 12 images to a group, all quite different in style. Soon after Versions of the Self, I started to hire models again on a regular basis, and I did a lot more small heads. Interestingly enough, they were never likenesses. But you’d get a sense of portraiture, where likeness is involved. I thought of them as equivalents, variations on that person. AJ Equivalents? As in Steichen? RH Yes, sort of, and as in a piece I did some years ago: six Polaroids shot in Portland with NY addresses. Title: “Equivalents.” Hangs right above my computer. AJ What I saw in the self-portrait groups was a wry attempt at likeness, a sort of comic proof of the impossibility of seeing oneself. They all looked like you, though no two were alike. The bones were different, not just the style. RH I preferred to think of them not as portraits, but rather just drawings of what I could see, made without getting scared, tightening up and trying to make a likeness. Inevitably, I would fail. The drawing would lose its qualities. The process would be unhappy and the end results would not be very good. As soon as I just said I’m not going to try for a likeness—if I winged it, if I said I’ll just try to make an interesting drawing and see what happens from there—I would get better results. AJ In the current drawings, it’s the same, isn’t it? There’s likeness. Every drawing of the same model, no matter how different, is recognizable as that person. RH I would be uneasy using the word portrait, though. For most people the word implies a true likeness, which in my drawings I find misleading. There’s often a resemblance in some of the features, etc., but that’s just a byproduct. Any likeness is purely coincidental. For the drawing to be “done” has really nothing to do with whether I caught a likeness. My current drawings are really a departure. The self-portraits were interesting to do, but with this work I am able to use much more imagination and be more playful. I can be more inventive and start mixing up media. I’ll take a pencil or colored pencil, or sometimes chalk, or even ballpoint or black ink, and once I have the model set up, I start just marking up the page a bit. Then I can start drawing rather freely from the model, sometimes with a general kind of outline—it will usually be quite unsatisfactory—just to get some idea of placement and scale. 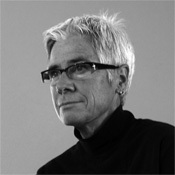 Sometimes I’ll just start with the edge of the eyeglass, say, or an earring, and develop the image out of that. I’ll jump from one object to another. I’ve stopped thinking about proportions. My earlier work was closer to academic drawing, and the approach I used over and over again was consistent. In breaking away, in the last few years, I began to do less planning and rely more on intuition. I started elaborating along the edge of forms, trying different line combinations, letting go of consistency. And I would think, I’m going to throw some color into this. Often I would end up with a fistful of pencils of different colors, which I used rather intuitively. Or I’d leave a pile of pencils out on my table and sometimes grab one and make a mark without looking to seeing what color it was. But that mark would go just so far across the page. I’d look at it and decide if I was going to use that mark again. AJ How do you handle your sessions with the models? RH I never do more than three drawings at a three-hour sitting. There’s pressure in that time constraint. I always know I am not going to revise. My approach is hit-or-miss. I have the attitude that I’m just going to put some lines down, do something, start a drawing, see where it goes and have some fun. But with the time limit, there’s tension. I only have three hours and I can’t start right in drawing the model. First I have to put some lines down, some marks and grids, anything that will remind me it’s a flat sheet of paper. AJ True to your modernist roots. RH Yes, I start with flatness. I always know I will add all kinds of illusionistic space as a byproduct of drawing the figure, but the idea that the image happens on a flat surface somehow allows me to mess up that surface, to play around with it. The drawing isn’t precious any more. AJ Once you get going on the figure, what happens when you bump into the scribbles or grids or spots? RH That work at the beginning, marking up the surface—that’s just the Big Bang. Once the marks are down, I don’t give them much conscious attention, but I’ll respond intuitively. Sometimes I might echo a color. Toward the end of the drawing, if one of those marks is right on the tip of the sitter’s nose, say a spot of color, well, I might erase it. Or just repeat it somewhere else. AJ In some drawings, you shift your viewpoint from part to part—the result is like an airy sort of cubism. Take Shadow, for example. Or look at Eyeshadow . You draw one eye from one angle and the nose from a different angle and the mouth from still a different place. The features migrate the way they might in a portrait by Cezanne, or more so. Does that relate to what you said about moving around the drawing, working on one part, jumping to something else? RH When I taught drawing, one of the things we dealt with was structure and seeing relationships between forms that are more or less “correct.” I was showing students how to put together a form, that it’s a series of relationships based on landmarks on the page you can refer to once you get a few down. In my recent drawings, I’ve really gotten away from that. This is nothing I’m thinking about logically, it’s just something that happens. I’m saying why couldn’t this eye be blue, and I don’t want this eye to look like the other eye, and there’s another way to draw that. If I start something and get impatient with it and think, well maybe this area needs to be filled in, I don’t fill it in, I stop. Maybe it has something to do with the scale, with how many marks I want to put in. I want the image to blow apart. I want to keep the whole drawing blown apart, fragmented. AJ Why does that appeal to you? RH The planes in my drawings should be elusive, and shift about. I need to leave breathing room, lots of white paper. I like to leave escape routes, ways out and into the drawing. No filled-in coloring books for me. No stained glass windows. It’s a completely enjoyable process. On the other hand I’ve come up with some pretty horrible drawings. But sometimes what I like about a drawing is that it looks like an amateur had done parts of it. RH It was a serape! The thing I’m talking about might be just a clumsy way to describe a form and might not look very good. By itself, it doesn’t make sense, but I try to use it. I don’t want a homogeneous drawing. I want a drawing that’s alive, where things happen. I don’t want to be consistent, predictable. Overall, though, the drawings do have a certain kind of pattern. AJ They’re clearly from the same hand, the same vision. AJ May I ask about the show’s title? Beauties, simple enough—but is there a veiled argument here about tradition, about traditional beauties in art that might be suspect today? RH Well, I don’t quite know what to say about that, except I consider them all beauties, all three of them—my models. And also I’m being a smart aleck—to me, some of these drawings are real beauties. That’s all. I wasn’t challenging current-day attitudes. I wasn’t throwing out a proposal that art should be beautiful. AJ You’ve done two shows I know of using the same three models. How did you choose them? RH Yes, I work with these models on an ongoing basis. Three Graces was the title of the other show I did with them. I look for people who are not just physically interesting to me but also have some imagination and a kind of personality I enjoy. AJ Why are they always women? RH Aesthetically, women are more interesting to draw. It really does have something to do with bone structure and delicacy of the planes. And the way they can change the shape of their hair with only a rubber band. Women look better in clothes than men. Also, eventually I got tired of drawing that bald-headed guy with the glasses over and over. No matter that I got so many variations, I needed a break. And women are interesting to listen to, especially when drawing. AJ Your sympathy for the models does show up in the drawings. You somehow maintain a pretty concentrated sense of the person. Yet at the same time you make sorties into the field of the drawing, doing abstract improvisations with the lines and shapes, setting up conversations between an earring and a collar, things like that. One imagines you are “away” from the person you are drawing for long spells. The images become vaporous. In your eyes, is there any message in the fragmentary, open, transparent quality of these drawings? Any statement, that is, as to the conditions of life, the nature of personality? That fragmentation of the image that you enjoy, and the transparency—those things really give the sitters sort of a temporary look. RH Openness, airiness, transparency! I love those qualities. Drawing is the best way for me to get at them. When a work of art has these qualities, my feet move directly across the museum floor toward that image. I am often more attracted to artists’ drawings than their paintings. AJ As long as you bring up museums, let’s talk about your relation to present and historical figures in art. Your drawings always seem haunted to me. Who are the ghosts? You’ll have to fill in the list, but I see Cezanne and Picasso, John Graham and Gorky, DeKooning, patches of Twombly, Matisse. Who else? Holbein, Ingres… You’ve always traveled to collections and exhibitions all over the US and Europe. I don’t know any artist more steeped in art history. Your drawings are all your own—I‘m not saying they aren’t—they’re just kind of lit up by everything you’ve taken in. How much does art history come into your daily practice? RH Well, that’s interesting, because in most cases I approach a drawing with nothing particular in mind. Sometimes I have an idea and sit down, and the model takes a pose, and the pose suggests an approach, and what happens is the drawing might end up related to a drawing by an historical artist, but even though I’m interested in art history, it’s kind of a subconscious byproduct. I don’t often identify any connections at all. AJ When you made Pendant, with the clear, crossed eyes and a little red mark on the long neck, a red slit, you weren’t thinking of John Graham? RH I think the year before, in New York, I had seen a few of Graham’s drawings. I really liked those drawings, and I came back and tried to get some of those qualities in my own. Some ideas had to do with mark-making some had to do with focusing on the head, maybe using some different media. Actually, you’re right, I guess the one that comes closest is Pendant. RH To return to your question about art history, no, I really don’t think about it much when I’m drawing. I just have a repertoire of things that maybe I’ve shown students when talking about ways of making form with a pencil. For years my primary enjoyment in teaching was teaching observational drawing—from the figure or from objects. I enjoyed discussing something with a pencil, sitting down where the student was sitting and then talking while drawing out an explanation, which was often fragmentary, at the edge of the page; and I think some of that is carried over into all those fragmentary elements in my drawings. AJ Teaching meant a lot to you, didn’t it? You worked hard at it. RH There was always something new to my teaching process. For me the most exciting part of the work was just coming up with a really logical explanation for a student, one that was completely clear to me and hopefully was clear to the student, an explanation that I could convey verbally only in part. I would have to show it. This is just part of the way I was taught, you know, in the atelier, where the instructor comes around, sits down, shows you how you might look at something, and gives an example. AJ Drawing in the margins? RH Yes, in the margins. There was a whole period when I would just really look forward to coming in to teach drawing. I would be thrilled, because it was going to be an interesting afternoon. I would enjoy it and hope the students did too. AJ I hear they did, year after year, for thirty-four years…. RH Yes, sometimes. So that was the most enjoyable part of teaching for me, that kind of drawing. The other things I enjoyed too, but direct observational drawing, that was my mainstay. AJ I didn’t know that. Your drawing classes are legendary, so I always imagined you had a good time with them, but I didn’t understand that teaching was a type of drawing exercise for you, that you found it such a rich way to rehearse the possibilities of drawing. RH And I could talk and draw at the same time. RH I could. I would talk a bit, and occasionally I’d use some figurative language, some kind of a metaphor to help the students connect with what I was drawing. AJ Well, speaking of figurative language, why don’t we talk a little about your writing? We could start with “Actaeon in the Studio of Diana,” the very short story that’s printed in this catalog. It inverts the myth, right? In your story, Actaeon ends up disrobed, not Diana. You bend the original, add some new materials, and come up with an allegory of drawing, or so it seems to me. RH It was fun to make up a new story from mythology, an invention. I’d been reading Horace Gregory’s translation of Ovid at the time. Writing “Actaeon” was a way into that book—I think that’s why I wrote it. Actually, I don’t really know how that story came about. I have no idea. I just started writing. AJ “Actaeon” is about art. I think you said all your stories are about art? RH Yes, but each one is an adventure story, always, purely an adventure story. All of them are about art, but that’s just a way for me to travel through an adventure. AJ But the language, the style—it’s quite playful. You seem to gather stylistic notes and turns of phrase from different sources. The narration isn’t transparent. I’m just as aware of the writing as of the story. In this respect your writing starts to feel like your drawing. The writing makes a surface, like the marks and grids on your drawings. That surface is right here. You look through it, and there’s the story, someplace else, moving through time. Does this metaphor make sense? RH It’s interesting, but I really don’t think about style. All I can tell you is that the sound has to be right. It has to be musical. And the pieces have to fit together. It takes a lot of rewrites to get that far. The historical sources, that’s something I can talk about. 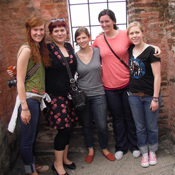 The women have a seventies attitude—or maybe not. The story seems to be set in the Village. That’s why “village” is capitalized. It happens in the twenties, thirties, forties—an interesting period in American painting, well, not just American. AJ These anachronisms—the Village in the thirties, the classical elements, the women in the seventies—they make the same scene feels like it’s happening simultaneously in different eras. This has a flattening effect, don’t you think? Yet the adventure keeps right on happening. It has enough space. RH It’s all intuitive. What I do know is that I’m writing the stories I might have read as a kid, and that’s why they’re always adventures. I started them because I like the idea of the Flemish painters and how their work was like the Brothers Grimm, particularly Brueghel’s. I thought, that’s kind of an interesting idea. What if I make up these little fairy stories and use as the protagonists real individuals who existed. I knew something about historic writing, and that was half of it, and I did a little research here and there about what was in existence during a particular time, in terms of the culture. AJ Before we close, one more question about “Actaeon.” I’d like to ask you about an image I find really surprising, that image of drawing’s destructive power. AJ Did I miss something? RH No I think I missed something. What do you mean by “destructive”? RH Oh, yes, that’s right. RH Yes, through a magical process. They did. AJ They took on the role of the dogs that ate him alive. RH That particular idea of tearing apart came without a conscious tie-in, but I think you’re right. Being drawn, in the story, is an equivalent of being torn apart. That was probably in the back of my mind, but it’s funny, I didn’t see the drawings as weapons. AJ What about all those sharpened pencils? RH Well, that’s just the way it works. Those are the tools. 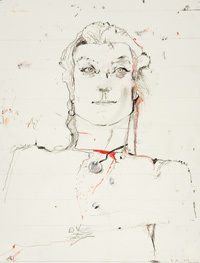 Hanson's recent drawings are part of his long-term and ongoing fascination with the human head. 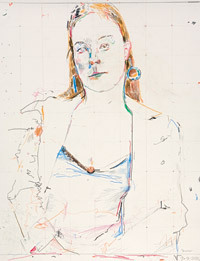 Hanson employs a variety of lines, marks, and bits of subjective color to reinvent what he is seeing. 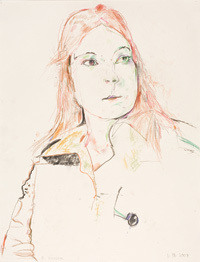 The resulting drawing is not a portrait but a surprising variation on the original. An long-time Professor of Painting and Drawing at PNCA, Hanson has remained a working artist in the Pacific Northwest since the early seventies. Portrait by Heather Zinger '10. Artwork photos by Lommasson Pictures LLC.